Nutter butter cookies mixed with cream cheese and Reese's peanut butter cups and shaped into little balls. Dip each ball in melted chocolate and you have a no-bake treat that everyone will be raving about. When it comes to desserts, our favorite combination is anything with chocolate and peanut butter. 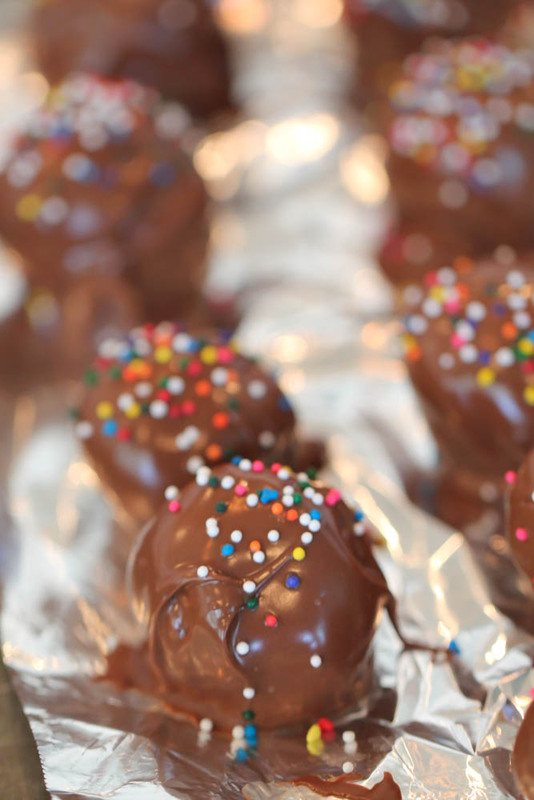 These delicious no-bake truffles will quickly become your go-to dessert. You can even put your kids in charge of making them! Start with a a package of Nutter Butter cookies. Stick those cookies in the blender and blend them until they are fine crumbs. Add room temperature cream cheese to the blender until completely mixed together. Move the dough into a bowl and gently fold in the chopped peanut butter cups (feel free to sample the dough at this point – it’s delicious). Melt the chocolate chips and shortening together in the microwave, stirring every 15 seconds until smooth. Dip each truffle (I usually use a fork or you could use a chocolate dipping tool that makes it easy!) in the melted chocolate and place back on the cookie sheet. 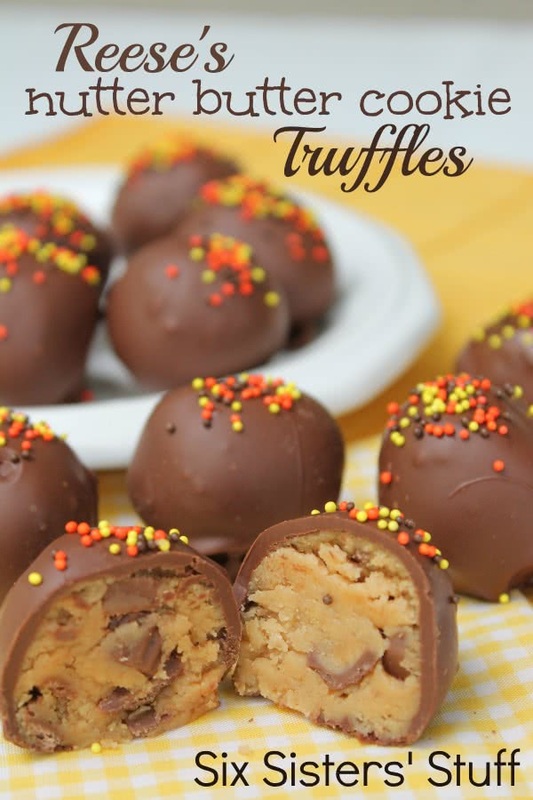 These truffles are adapted from our Oreo Cookie Truffles – we just swapped out the Oreo cookies with Nutter Butters and added our favorite candy bar! Blend the Nutter Butter cookies in a food processor until they are fine crumbs. Then break up the cream cheese into chunks and blend that together with the crumbs in the food processor until well blended. Remove blade from blender or transfer dough to another bowl. Gently fold in the quartered Reese's peanut butter cups (I used the very small mini Reese's that come unwrapped). Roll dough into 1 inch balls and place on a cookie sheet lined with waxed paper or parchment paper. Stick in the freezer for about 30 to 40 minutes. Melt the chocolate chips and shortening in a microwave safe bowl stirring every 30 seconds until smooth. Dip each frozen truffle into the melted chocolate. Cover them completely with chocolate, then lift up and gently tap to remove the excess chocolate. We used a plastic fork to dip each truffle, but you could also use a chocolate dipping tool. Set truffle back onto the cookie sheet covered in waxed paper. Immediately add the sprinkles before the chocolate sets up. Repeat the process until all the truffles are covered in chocolate. The chocolate will set up quickly because the balls are so cold from being in the freezer. Oh yeah! PB and chocolate...the best! thanks for sharing! Is there something you can substitute for the shortening? Not that the rest of the ingredients are super healthy.... :) But my research shows me that shortening is really not a great thing to be using in anything. Just curious what your thoughts are. Would butter work? A teaspoon or two of vegetable oil will also work. Coconut oil, it naturally solidifies at room temperature. Coconut oil. (Get refined if you do not want a coconut taste). How much refined coconut oil would be needed in substitute of the shortening? what about using the Gulf wax or the dipping chocolate? I have used both when I make my peanut butter balls. You can also use palm oil. It's used as shortening. You can find it at Sprouts in the baking area. Coconut oil is a great substitute for shortening in this recipe with dipping chocolate. I dont have a food processor. What is the next best thing to use. You could try a blender or a rolling pin. You want them to be crushed fine, no chunks. I don't have a food processor. Would something else do the trick? You could try and crush them in a blender or with a rolling pin. You want them to be fine crumbs, no chunks. Thank you for the recipe! I am preparing to make these for Father's Day for two very special men who happen to LOVE peanut butter. These look great!!!!! I love all your recipes! This looks like the best possible dessert. So, vegetable oil will work instead of shortening? I just don't want to buy shortening because I never use it, and I'd rather use what I have. I'm so excited to make this! As these need to be in the fridge -- does the chocolate coating bloom? sweat? thanks !!! When we made it the chocolate coating did not sweat! They also didn't last very long! They were a big hit! I have never seen nutter butter cookies either but the peanut butter cookies I can by do I keep cookies and the peanut butter parts to use? You use the whole cookie to make the fine crumbs (that includes the peanut butter filling). The Target brand of peanut butter cookies are excellent and much cheaper! I think they taste better than the Nutter Butters. can I make these ahead of time and freeze until party day? Yes, these will freeze just fine in an airtight container or a freezer bag. These are fabulous! My daughter and I just finished them. Wow....amazing! I have a a "heavenly cake pop roller" and I used that to form the balls - super easy and they turned out great! Thanks for an amazing recipe! Can I use the chocolate candy coating(stuff you use for chocolate covered strawberry) instead of chocolate chips? Thanks! That would work just fine in place of chocolate chips. Instead of shortening you could use coconut oil, much healthier. Use refined coconut oil if you don't want that coconut taste. Considering all the other fat ingredients, 3/4 T of shortening should not even factor into deciding to make these, or not. It's a treat, not part of a healthy, daily diet. I don't know if it's just me, but I don't see any list of ingredients. Just the word "Ingredients:" and then they list the directions. If someone could point out where I should be looking, I would appreciate it. I tried highlighting over the space, but no words appeared. Thanks! We just went to the post and all of the ingredients are listed. Not sure why it doesn't show up for you. I was wondering if you have ever tried to freeze these and pull out a little at a time? These will freeze just fine and you can easily pull them out as needed! Can anyone tell me Why, sometimes when I melt the coating waffers. and let them setup in a cold room, they will get a white film (the candy) on them... Why does this happen??? When crushing the nutter butter cookies, am I crushing the cookie part and the peanut butter filling part together? Also if I use coconut oil would the amount used be the same as if i used the shortening? Hi Missy, crush the whole cookie together. 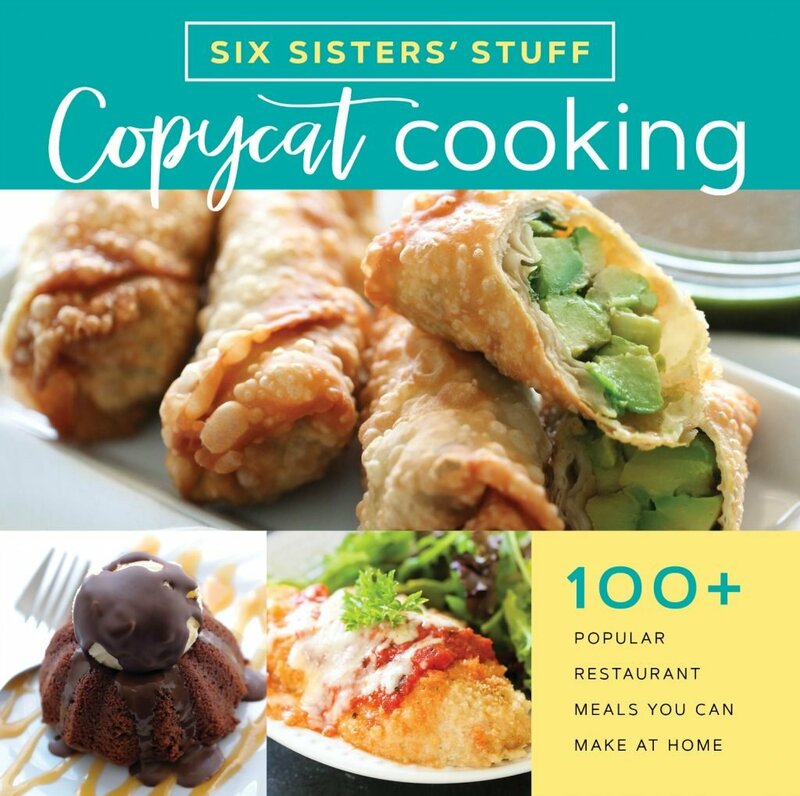 We have not made this recipe using coconut oil. I require a gluten free diet. There are a sort of "Oreo" cookie by Glutino, but they're not very good. They also have a white/vanilla cookie similar to Golden Oreos, which are quite good. Thoughts? Would the consistency work w/out any cookies? 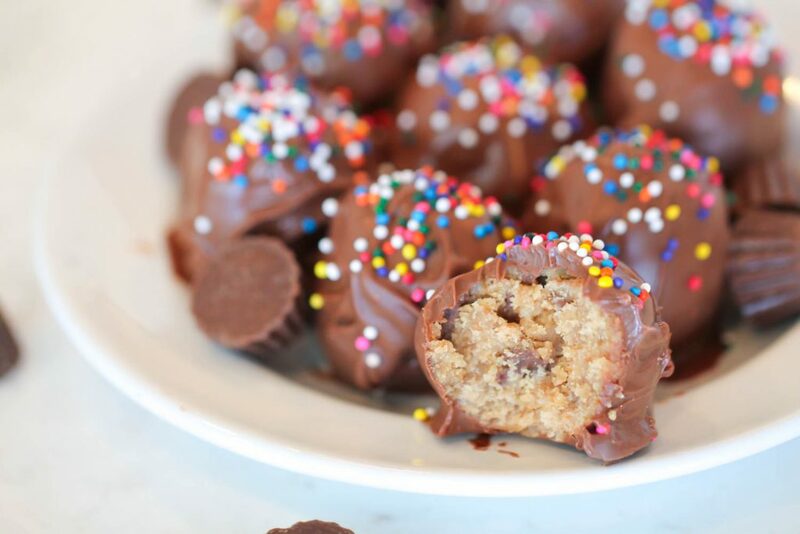 We have only made the nutter butter cookie truffles as directed on our recipe. You could try substituting the gluten free cookie in place of the nutter butter cookies. The taste will be different since it's not a peanut butter flavored cookie. But if it's similar to a golden oreo it should still taste good! These look absolutely amazing. I am a big fan of chocolate and peanut butter. I saw this recipe on Facebook. Would love if you could stop by and share with Kids and a Mom in the Kitchen. http://totsandme.blogspot.com/2014/11/kids-and-mom-in-kitchen-100-surprise.html Have a great day! I just finished making these. I plan to take them, along with some pies, to my daughter's home for Thanksgiving. I had to taste one . . . I have a feeling that they will not last very long! So easy and so good!! A definite keeper!! Great recipe .. But how many days can we store it??.. They can be easily stored in an airtight container in the fridge for a few weeks. I melted Merkins break up chocolate instead of melted chocolate chips. The coating seems a little soft to the touch. I had hoped for more of a candy shell. Was there a better choice ? The recipe is wonderful! Chocolate chips work the best. I live in Canada and do not have Nutter Butter Cookies. Would any sandwich cookie with a peanut butter type filling work? Do these have to be refrigerated after they are done, or can they stay on the counter in an airtight container? They will be fine on the counter for a few hours, but if they last longer than that you may want to keep them in the fridge because of the cream cheese. I was wondering if I could use a blender or just a plastic bag and rolling pin to crush the cookies ? I am making these and the oreo ones and I don't have a food processor ! You could use your blender, just do it long enough that you get fine crumbs. I'm preparing to make the chocolate coating. Am I reading this correctly--12 oz. of milk chocolate chips and ONLY 3/4 of a TABLESPOON of shortening? Thanks! Yes, you have it right! These are our favorites! Do these require refrigeration after making them ? I am always looking for things to send my deployed husband and his soldiers and they would LOVE these!! Mailing time is about 7-10 days. Thanks!! Hi Diane, with cream cheese in the recipe they need to be refrigerated. I'm afraid your soldiers would get sick after having them being shipped for 7 to 10 days. Our Reese's Rice Krispie Treats might ship well!! And a BIG THANK YOU to your husband and all the troops for all they do!! can i use white chocolate and dye it pink? id love to make these for my daughters birthday party. You just have to be careful dying white chocolate so that it doesn't seize. You would be better of buying the pink melting chocolate at a craft store and then you won't have to dye it. The chocolate is too thick to dip into. Will not make these again. It's possible the chocolate didnt get hot enough to thin out. Also, I have noticed the brand of chocolate chips can make a world of difference, not just in texture, but taste. I would like to make 4 or 5 of your truffles for my daughter's wedding...can they all be frozen and if so is there any issues with the chocolate when thawing? Just freeze them in an airtight container and they will be fine. Can't wait to make the nutter butter truffle. But I have to wait a couple of weeks until I get the cast off my left hand and thumb. oh yum I need to try these! My husband and I love peanut butter and this sounds so yummy, but I'm on a gluten free diet so I will look for some peanut butter or chocolate cookie that will work. Also I will use the coconut oil instead of the shorting it taste richer. Can't wait to try it. Thank you!! Can you use semi-sweet chocolate chips instead and do you think they would still be good? You could use semi sweet chocolate chips in place of the milk chocolate chips. We like the taste of milk chocolate chips better, but it's a personal preference.